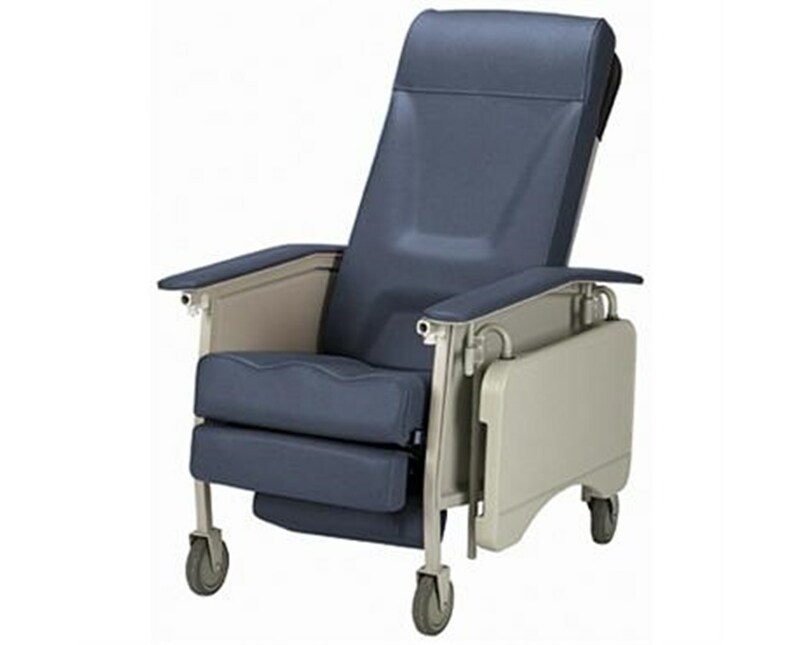 The IH6065A Deluxe Adult three-position recliner offers exceptional comfort and durability for day room or resident room environments. 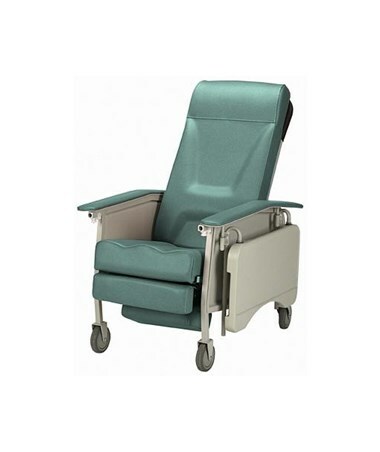 The full-recline, leg-ottoman elevated and full upright positions provide maximum flexibility for residents. The convenient blow molded overlap table on the IH6065A Deluxe Recliner can slide on and off, or can be locked in one of five positions. An ergonomically designed seat back and articulating headrest maximize individual comfort requirements on this Recliner. A special cross-weave in the foam back and seat cushions reduces the risk of "bottoming out". The IH6065A Deluxe Recliner is easy to maneuver with the push bar on chair back and four rolling casters. The rear casters may be locked to secure the chair in place. Zinc plated caster horns for improved rust resistance. Durable vinyl and removable side panels make the IH6065A Recliner very easy to clean. The IH6065A Deluxe Adult 3 Position Recliner has a 250 pound weight capacity and meets California Technical Bulletin 117 Standard Fire Safety. It is protected by a 1 year Upholstery Warranty and a 3 year Frame Warranty. You can view our color chart for color options. Please specify the color you want by choosing in the drop-down box at the top of the page. Special cross-weave in the foam back and seat cushions reduces the risk of "bottoming out"